My favorite cakes to decorate are weding cakes! A dramatic shape for impressive tiered cakes. Create this contemporary look for weddings, showers, anniversaries and more—the unique diamond shape is a stunning foundation for rolled fondant (as shown here). 0 Questions - Post a Question instructions Several days in advance, make 6 to 8 gum paste roses using large cutter from set. Make 10 to 12 green leaves on wires according to instructions in book. Set aside to dry. Cut foam core one inch larger all around using largest pan as a guide. Brush foam core with pipe gel and cover with white fondant; set aside. Prepare 2-layer cakes for stacked construction and to be covered with fondant. 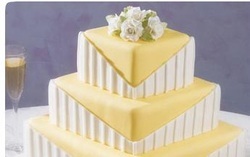 Cover cakes with yellow fondant. Stack cakes on fondant-covered board. Using pan as a guide, cut panels of white fondant 1/8 in. thick and 4 in. high down to 1 in. high. Length with varying depending on cake size. Attach white fondant panels to sides of cake with damp brush and seam edges together. Cut strips of fondant 1/16 in. thick x 1/4 in. wide. Attach to fondant panels with damp brush, trim panel, space approximately 3/4 in. to 1 in. apart. Form a 2 x 1/2 in. fondant base for flowers and leaves. 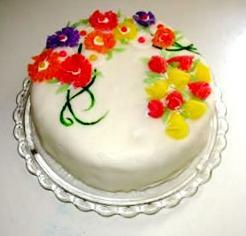 Position 6 flowers and 10 leaves on cake. Cake serves 116 as a party cake. If used as a wedding cake, the top tier is traditionally saved for the first anniversary and the number of servings does not include the top tier; in that case it will serve 98. In a large bowl, stir together the shortening and corn syrup. Mix in the salt and vanilla flavoring, then gradually mix in the confectioners' sugar until it is a stiff dough. If you are using a stand mixer, use the dough hook attachment. Otherwise, knead by hand. If the dough is sticky, knead in more confectioners' sugar until it is smooth. Store in an airtight container at room temperature or in the refrigerator. To use, roll out on a clean surface that has been dusted with confectioners' sugar until it is 1/8 inch thick or thinner if you can. Drape over frosted and chilled cakes and smooth the sides down, or cut into strips to make bows and other decorations. In large bowl, beat butter and cream cheese with electric mixer until light and fluffy. Gradually add confectioners’ sugar and milk. Beat on high until smooth (30 – 60 seconds). If icing seems too thin, add confectioners’ sugar 1 tablespoon at a time. If it seems too thick, add more milk 1 teaspoon at a time until icing reaches desired consistency. Our Buttercream Icing recipe is perfect for spreading or decorating. Follow our instructions to make it the ideal consistency you need. I prefer Marshmallow Fondant over Rolled Fondant, but you might like this more. Try a half recipe of each and see witch one you like most. Makes: About 36 ounces of fondant. Combine gelatin and cold water; let stand until thick, about 3 minutes. Place gelatin mixture in top of double boiler and heat and stir until dissolved. Add glucose, mix well. Stir in shortening; just before completely melted remove from heat. Add glycerin, flavoring and color. Cool until lukewarm. In large bowl, place 4 cups confectioners' sugar; make a well. Pour the lukewarm gelatin mixture into the well and stir with a wooden spoon, mixing in sugar and adding more, a little at a time, until stickiness disappears. Knead in remaining sugar. Knead until the fondant is smooth, pliable and does not stick to your hands. If fondant is too soft, add more sugar; if too stiff, add water (a drop at a time). Use fondant immediately or store in airtight container in a cool, dry place. Use fondant immediately or store in airtight container at room temperature until needed. If storing longer than 1 week, refrigerate. Bring to room temperature before kneading. Do not freeze. When ready to use, knead again until soft. This recipe yields enough to cover a 10 x 4 in. high round cake. If fondant becomes dry, either by adding too much sugar or air drying, add small amount of solid vegetable shortening and knead thoroughly. Tint a small ball or enough fondant to cover a whole cake. As with any icing, tint colors at one time; matching colors later may be difficult. Add just a little of the concentrated icing color at a time, until you arrive at the exact shade you want. If you'd rather not mix color yourself, use pre-tinted fondant in a variety of pastel, primary, neon and natural shades. Any type of flavoring can be used — regular food flavors (vanilla, almond, etc.) or candy flavorings. Candy flavorings are very concentrated and should only be added by drops. Flavor the fondant lightly so it does not detract from the flavor of the cake. Step 1: Add Dots of Color Roll fondant into a ball, kneading until it's soft and pliable. Using a toothpick, add dots of icing color or drops of flavor in several spots. Step 2: Knead color Knead color or flavor into your fondant ball. We suggest using food-safe gloves when coloring fondant to keep your hands stain-free. Step 3: Knead Until Blended Continue kneading until color is evenly blended; add a little more color or flavor if needed. Deep colors: When making deep colors, such as black, brown, or red use Wilton paste food colors in larger amounts than normal. It can take as much as 1 oz. paste food color per one cup to obtain deep colors. Deep colors are recommended for accent colors only. Fading colors: Sunlight or fluorescent light will cause some colors to fade. After the cake is decorated, it is best to keep in a cool room and out of direct light. Stain removal: All deep colors in nature stain, like blueberries, but none of them are harmful. Paste colors can stain teeth and skin; however, simply washing skin area with soap and warm water will remove color. Bleach can be used on counter tops. Lukewarm water should be used first to spot stained color. Rinse thoroughly, allow to dry. If color is still visible use a commercial cleaner on garment, carpet, upholstery, etc. In the case of a color that has Red 3 as an ingredient use an acid such as vinegar or lemon juice to soak stain first. Proceed with lukewarm water and then allow to dry before using a commercial cleaner. Red: There are three different reds - Christmas Red, a blue-toned red; Red-Red, an orange toned red; and Red-No Taste, a blue toned red. It can take as much as 1 oz. of red paste color to one cup of icing to get a deep red. When icing is colored deep red, a bitter aftertaste may be detected. 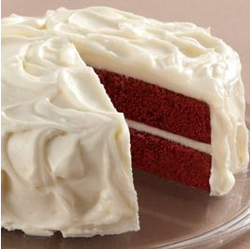 Red No-Taste should be used when a large portion of red coloring is used on the cake. Red No-Taste does not contain red 3 which causes the bitter taste. Green Leaf Green is a brighter green with more yellow than Kelly Green. Both of these greens require very little color, how much color added depends on the tone of the green you want. Hot Pink Rose paste color will obtain hot pink with good results. Rose Petal is a soft, muted rose color. Pink is a traditional pastel with a slight yellow tone. Blue Royal Blue has a red tone. Sky Blue has a yellow tone. Daffodil Yellow Daffodil Yellow is an all natural food coloring and does not contain yellow #5. (Many people are allergic to this). Daffodil Yellow currently contains alcohol which all other colors do not have present. Black When white buttercream is tinted dark black, it also can have a bitter taste. Use dark chocolate icing with a small amount of black color added. Brown Brown color occasionally has a green overtone to it. This usually occurs with the presence of acid in the icing; lemon juice or cream of tartar. Omit the acid if tinting icing brown. Also dissolving brown color in 1/4 teaspoon water before adding to icing will eliminate the green tone. White-White White-white is used for lightening icing that has been colored too dark. Also use it for making white buttercream made with butter or margarine. Makes: About 2 pounds marshmallow fondant. instructions To make marshmallow fondant, place marshmallows and 2 tablespoons of water in a microwave-safe bowl. Microwave 30 seconds on high; stir until mixed well. Continue microwaving 30 seconds more; stir again. Continue until melted (about 2 1/2 minutes). Place 3/4 of the confectioners' sugar on top of the melted marshmallow mixture. Fold sugar into marshmallow mixture. Flavoring can be added at this point if desired. Place solid vegetable shortening in easily accessed bowl so you can reach into it with fingers as you are working. Grease hands and counter GENEROUSLY; turn marshmallow mixture onto counter. Start kneading like you would dough. Continue kneading, adding additional confectioners' sugar and re-greasing hands and counter so the fondant doesn't stick. If the marshmallow fondant is tearing easily, it is too dry; add water (about 1/2 tablespoon at a time) kneading until fondant forms a firm, smooth elastic ball that will stretch without tearing, about 8 minutes. It's best to allow Marshmallow Fondant to sit, double-wrapped, overnight. Prepare the fondant for storing by coating with a thin layer of solid vegetable shortening, wrap in plastic wrap and then place in resealable bag. Squeeze out as much air as possible. Marshmallow Fondant will keep well in refrigerator for several weeks. When not working with fondant, make sure to keep it covered with plastic wrap or in a bag to prevent it from drying out. When ready to use, knead fondant until smooth. Roll out fondant 1/8 in. thick. To color fondant: If you need to tint the entire batch of fondant, add a little icing color to the melted marshmallow mixture before adding confectioners' sugar. For smaller amounts of tinted fondant, add icing color to portions of fondant as needed. My favorite part about making cakes is decorating them! Most of the recipes and techniques were taken from Wilton, one of my favorite websites!